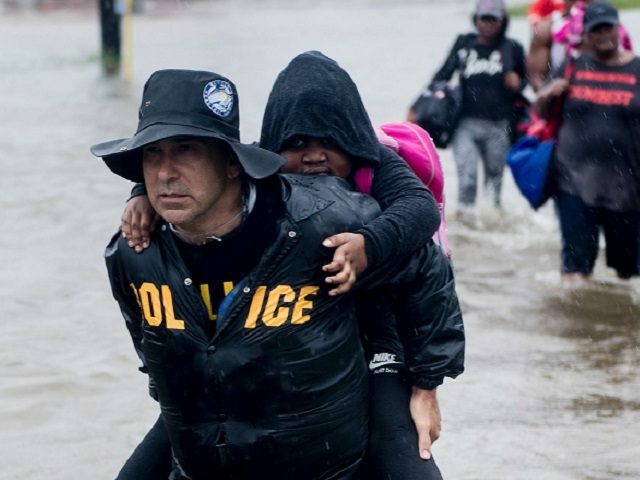 HOUSTON, Texas — Despite the loss or damage of their own homes, the men and women of the Houston Police Department put their duty first and stayed on the job to rescue those in danger, keep the peace, and save lives — even as they lost one of their own. Houston Police Chief Art Acevedo came face to face with what may become the worst natural disaster to hit a major city in U.S. history. Despite his only being on the job as police chief for nine months, the men and women who work for him have done an amazing job of serving the community in rapidly changing circumstances, weather conditions, and an overwhelming number of service requests. Acevedo said he has seen his officers responding to rescues, calls for service, and other emergencies with minimal food and rest, oftentimes wearing the same uniform for days. The chief discussed the tragic loss of one of his own officers, 34-year-veteran Sergeant Steve Perez, who drowned in his patrol car Monday night. “They show up — they’d been on for 37 hours — they had survived on having a couple of power bars,” he stated proudly. The dive team eventually found Sgt. Perez who had apparently accidentally driven into a flooded passageway while trying to find safe escape routes for evacuees. Acevedo praised all of the first-responders and volunteer rescue workers like the Cajun Navy, a team of boat owners from Louisiana that responded in force to help rescue flood victims — even as “Harvey” prepared to move to their home communities. “We should all take a moment and pause — take a day to just thank all of our first-responders and everybody that came here to help,” Acevedo expressed. Follow complete coverage of Hurricane Harvey and Houston Floods on Breitbart Texas.